c. 1867, University of Glasgow: William Thomson, or Lord Kelvin (namesake of the temperature scale and the man who coined the term ‘kinetic energy’) as he is today more frequently known, turns his considerable intellectual ability towards the daunting question of how all material in the universe might exist. At this time in scientific history, the idea that matter was composed of individual atoms of varying type was becoming increasingly accepted by academics. However, what remained a complete mystery to all was how these atoms could themselves exist. The person who could suggest a working theory to answer such a fundamental question would gain great prestige among the global community, and one idea of Kelvin’s allowed him to earn that honour… at least, for a decade or two. Ideas from several disciplines were combined in Kelvin’s elegant theory, including something which might appear to be a rather tangential discovery in physics, ideas from ancient Greek philosophy, and an idea from the emerging mathematics of ‘knot theory’. Each discipline played a part in Kelvin’s formulation of the theory of ‘vortex atoms’ which aimed to explain how atoms might exist. We will begin with the physics by considering a hurricane. We generally understand the ‘eye of the storm’ as an area in the centre of a hurricane in which the air is still, whilst outside the eye, winds swirl about in a consistently clockwise or anti-clockwise direction. The eye of the storm can be called a ‘vortex’, where the wind speed is zero, whilst outside the vortex, each point in space has a well-defined ‘phase’ (i.e. wind direction) and ‘intensity’ (i.e. wind speed). Such a vortex takes the shape of a continuous line, or ‘string’, stretching from the Earth’s surface to the sky. The insight Kelvin had was to realise that, like a piece of string in the conventional sense, vortices can be deformed out of the shape of a straight line and further, can have knots tied in them. It would then also be possible to join the ends of such a knotted string together, to form a continuous loop without any ends, which is in some way twisted up in itself. A string in which a knot has been tied and the ends then joined together is what modern mathematicians call a knot, and certain properties of knots are key in explaining Kelvin’s theory. The main property is that knots can be understood as being equivalent or distinct from each other in an intuitive way: given a ‘mathematical’ knot where the ends of a string have been joined together, is it possible to jiggle this string around so that it physically looks like another knot? If this is possible, then the two knots are equivalent; if not, then they are distinct. This complimented that which scientists wanted from an explanation of atomic structure – the distinctness of knots from each other could perhaps be linked to the distinctness of each chemical element. Equivalent knots could in some way represent atoms of the same element. So how could the concepts of vortices and knots be implemented in the physical world to explain how atoms actually exist? Greek philosophy comes in here: Aristotle (384-322 BCE) hypothesised that there might be a fluid substance permeating all of space, existing as a kind of backdrop to our visible reality; this he referred to as ‘aether’. It would allow material to pass through it, providing a potential explanation as to how light and matter might pass through space (for example, light from the Sun to the Earth). The notion that anything could travel through a vacuum was a difficult concept for both the ancient Greeks and the Victorians to accept. In Kelvin’s time, it was discovered that light and electric fields permeated space. Many scientists thought that the aether might explain how such fields could exist and propagate; and so, to combine this theory with how fields and atoms could together interact, Kelvin postulated that atoms may be manifest as knotted vortices within this aether, hence the name, vortex atom theory. In the same way that wind flows around the eye of a hurricane, aether would flow around the knotted atomic vortex. The long-lived nature of vortices supported the scientific understanding that atoms were stable: knots could be ‘linked’ together which would explain molecules of several atoms; distinct knots would represent distinct atomic elements. The hope was that if several physical principles could be explained with reference to this aether, the interactions taking place in the physical systems could be modelled. Alas, whilst Kelvin’s vortex atom theory was held up as a serious contender for explaining atomic structure until around the 1890s, subsequent scientific investigations, notably the Michelson-Morley experiment conducted in 1887, produced new results incompatible with the theory, dispelling the idea of the existence of an aether. The Michelson-Morley experiment attempted to quantify how much the aether (on the assumption that it existed and was the medium through which light propagated) moved compared to the Earth – the ‘aether wind’ – by measuring the speed of light travelling in different directions. In essence, the results showed that the speed of light was independent of the direction of travel, refuting the existence of an aether wind. But as with many discarded theories, the vortex atom theory was not without fruit. In the two decades for which the theory held sway, several physicists and chemists, notably Peter Guthrie Tait, investigated this new idea of knots within a scientific setting. Specifically, Tait set about classifying as many distinct knots as possible, thinking that this would define all possible chemical elements, in similar vein to Dimitri Mendeleev’s construction of the periodic table begun around the same time in 1869. The system of classification Tait used was to order the knots by ‘crossing number’, meaning the minimum number of times that the two-dimensional projection of a knot (the shadow of a knot) crosses over itself when all such possible projections of the knot are considered. Tait found 163 distinct knots during his study. Had the theory been correct, this would have predicted a number of possible chemical elements exceeding that shown in most modern periodic tables by 45, though without any clear link between knot structure and chemical properties suggested. 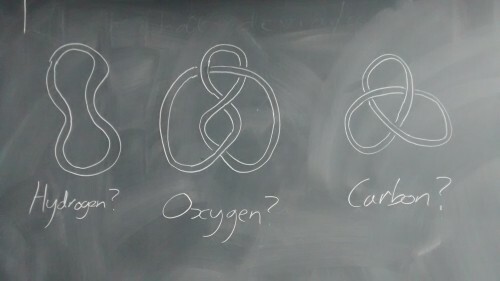 Today, the investigation of the many other properties of knots, under the umbrella term of ‘knot theory’, is a highly active research area within mathematics with wide application to examining the structure of proteins and DNA, investigating vortices within light, statistical mechanics, and indeed studying the wide range of physical knots used for practical or recreational purposes. Though Kelvin’s theory of vortex atoms ultimately proved incorrect, it beautifully combined varied ideas in physics and chemistry, and was crucial in scientific history in giving birth to mathematical knot theory. For these reasons, we must consider it an overall success to add to Lord Kelvin’s legacy, and a boon to the advancement of scientific knowledge. David Evans is a Mathematics PhD student within the SPOCK (Scientific Properties of Complex Knots) Project established at Durham and Bristol Universities and funded by the Leverhulme Trust. The Project aims to investigate various properties of knots, taking a multi-disciplinary approach across the fields of Mathematics, Chemistry, Physics and Anthropology.